A Socket Weld Flange is similar to slip-on flanges, however, socket welds have an internal recess on the inside diameter to allow for a smoother flow of the process fluid. The positive of this is that is creates a smooth bore with the proper welding and grinding. The negative of this type of flange is that it can be more expensive than a slip-on due to more intricate machining, and they can be less readily available than slip-ons due to the fact that the bottom half of the inside diameter must be made to the same schedule as the pipe that is being used. 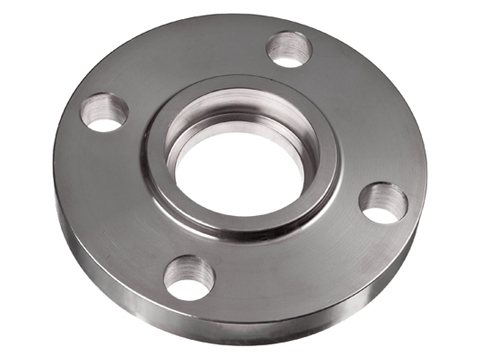 (you must specify the schedule needed) These socket weld flanges were initially developed for use on smaller sizes of pipe at higher pressure ratings.